Abu Garcia Raises the Speed Bar with their Rocket! 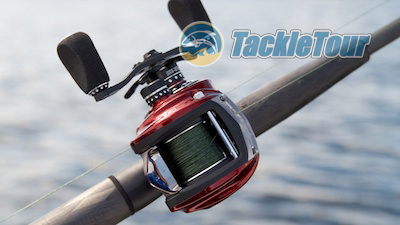 Introduction: With each passing year, the feature manufacturers of low profile baitcasing reels have been racing to surpass each other with has been the speed of their reels - more specifically, retrieve speed. Since the 7.1:1 threshold was broken, we witnessed incremental increases to 7.4 then 7.9 then 8.1, 8.5 until suddenly at last year's ICAST, Abu Garcia blew everyone away with the Revo Rocket - a 9.0:1 retrieve ratio reel. What could we possibly need in a reel this fast and more importantly, how fishable is a reel with this speed? Let's find out. 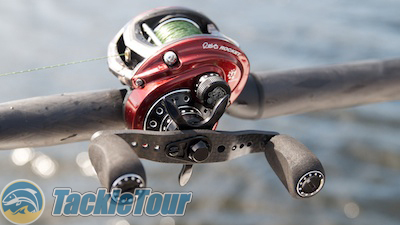 Introducing our review of Abu Garcia's blazing fast Revo Rocket baitcaster! Quality/Construction: If there's one thing to be said about Abu Garcia's entire suite of Revo reels it's that they are very consistent in their fit and finish. Sharing more or less the same body and sideplate design from the "S" through to the "Premier" and even with the offshoot "Winch", the new "Rocket" is no exception. The only difference I see from this reel and say the "STX" is the color and a few accents. Actually, the accents on the Rocket are more reminiscent of the "Premier". Similar to the STX, the Rocket is solid and refined right out of the box with a very clean finish and no unusual gaps or areas of misalignment between the frame, sideplates, and other accent pieces. There is no backplay in the handle and the knobs are relatively tight, but again like the STX, there is some degree of movement in the handle when pushed into and pulled away from the body of the reel. 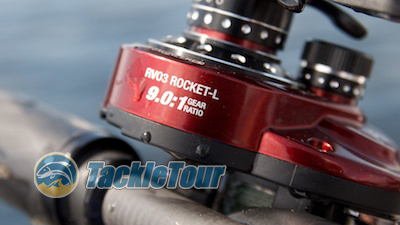 Performance: Given the familiarity with this reel and its braking system, my real interest in testing the Rocket was anything and everything I could do to tax that 9.0:1 gear. As such, I spooled this reel up with some Sufix 832 braid in 50lb test and paired it with an Edge Rods eight foot cranking stick. Spooled with 50lb braid and mounted on a graphite cranking stick for a pure test of power! Retrieve: The Rocket is aptly named for it's blazing fast 9.0:1 retrieve ratio. This retrieve ratio equates to somewhere between 18 to 36.5 inches depending upon how much line you have out on your cast. By comparison, the IPT (inches per turn) range for each of the available STX retrieve ratios are 12.5-26 inches for the 6.4:1, 14-29 inches for the 7.1:1, and 16 - 32.5 for the 8.0:1. This is a significant jump! Otherwise, actual feel of the reel during retrieve is smooth but not nearly as refined as I'd expect for a $300 reel. There's just a bit more gear noise and vibration than I was expecting making this reel more or less average when it comes to scoring this characteristic. Drag: In the lab and strapped up to the machine, maximum drag on our Revo Rocket peaked at 21.3lbs of pressure, but if you look at our Sweet Drag Performance Chart below, you'll see that as is common with all bass reels we've tested thus far, maximum drag comes at the expense of smooth and consistent performance. 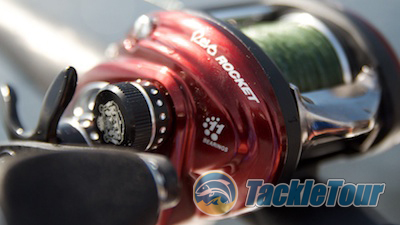 In the case of the Revo Rocket specifically, our test reel was very erratic at maximum lock down drag. 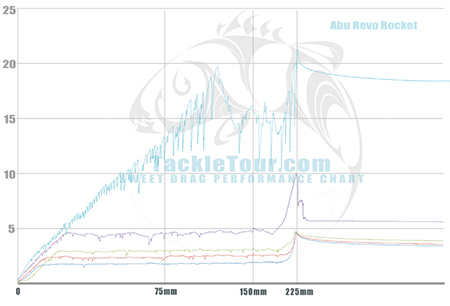 Fig 1: The Sweet Drag Performance chart above shows the consistency in drag performance of our Abu Garcia Revo Rocket. Note at the lower settings, the Rocket performed fine, but at full, finger tight lock down, the reel's drag becomes very erratic. Otherwise, once we began backing off the maximum setting, performance was relatively smooth and consistent. That is, until the end of three pulls we programmed into The Machine. For some reason, at each setting, we had a spike in drag performance towards the end run of the third pull. Out on the water, the largest bass I managed to hook with the Revo Rocket was a six pounder. This fish pulled a lot of drag as I tried to muscle it away from cover out on the California Delta and in this real world scenario, the Rocket's drag performed flawlessly. A look at the Rocket's drag stack. Power: I mentioned already the battle I had with a six pound largemouth out on the California Delta. While this fish made a few runs and was a little wild running side to side next to the boat, the Revo's monster gear ratio allowed me plenty of control and was actually a benefit when the fish charged the boat. 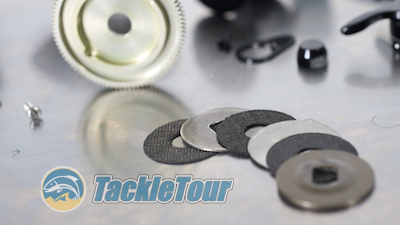 The question of power is natural with small reels like this especially when their retrieve ratios surpass 7.0:1. So given the Rockets ratio is set at 8.0:1, this reel really surprised me with the amount of control it afforded me. The Rocket's power comes from an oversized gear housed within this gearbox that some people find bothersome while palming the reel. 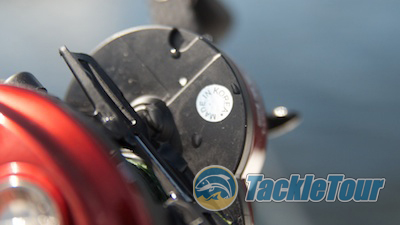 To carry things a bit further, as we are one to do here at TackleTour, the next natural progression was to tie on some deep diving cranks and see what this reel could truly handle with some steady, drawn out pressure. So on our next trip up to Clear Lake, CA, I loaded up on Strike King 10XDs and Lucky Craft SKT Magnums to see how the Rocket would perform cranking these extreme divers on braided line with a graphite cranking rod. The spec's of this reel align with the STX while the external detailing aligns with the Premier. The Rocket surprised me again. While it certainly is not my first choice as a deep cranking reel, the Rocket is totally fishable with these lures and for long periods of time! This is provided you're not already dragging the lure with your trolling motor and fighting against that type of pressure. 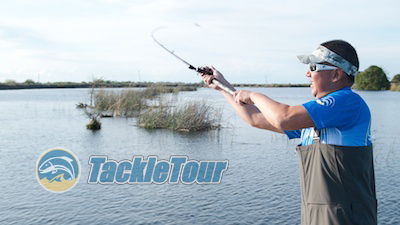 If the boat is drifting slowly or totally still, it's very easy to crank these baits with the Rocket. Testing casting range and distance on the CA Delta. Next Section: Casts like a "Rocket"